As mentioned in an earlier post, our charity of the year for 2014 was The British Heart Foundation. The charity is Britain’s number one heart charity and is funding the research and training needed to beat the UK’s biggest killer – coronary heart disease. The foundation has been raising awareness of heart disease and funding the research into the cure and prevention of it for over fifty years. Their latest campaign is to teach more people how to do CPR, and to be a potential lifesaver. 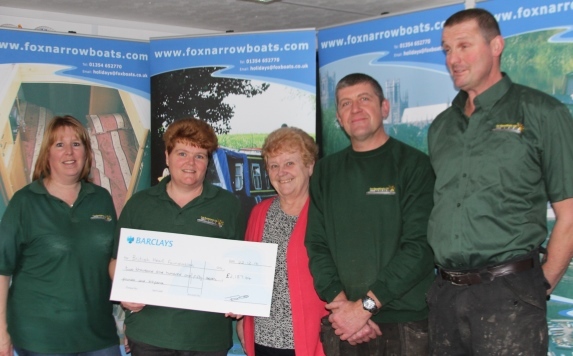 It is likely that everyone will be touched in some way by heart disease and problems in their lifetime, either personally or through having friends of family who have heart problems, and so we at Fox Boats are pleased to be doing our bit to help the Foundation. You can find out more information about the charity and about maintaining good heart health on the British Heart Foundation website. You could also do your own fundraising for the charity, the link to get involved is here. East Anglian Children’s Hospice supports families and cares for children and young people with life-threatening conditions across Cambridgeshire, Essex, Norfolk and Suffolk. Their care and support is tailored for the needs of all family members and delivered where the families wish – in their own home, at hospital, in the community or at one of three hospices in Ipswich, Milton and Quidenham. ‹ Merry Christmas from Fox Boats!